While my eating adventures last week took me to some of my favorite dining establishments in town (Bite Bistro, Franktuary, and Braddock's American Brasserie), I also tried two new recipes at home. One was the Blackened Tilapia Baja Tacos from Cooking Light, one of my favorite sources for simple, delicious, and healthy recipes. 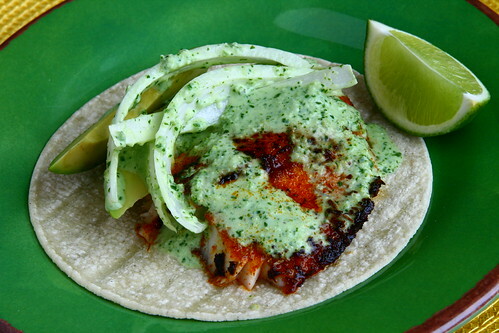 The blackened tilapia was full of spice, and the jalapeno-lime sauce was a refreshing complement to the fish. The onion and avocado slices complete the meal. The drippy sauce makes this a pretty messy taco meal, so I probably won't be bringing these tacos to work anytime soon, unless I wrap it completely in a large tortilla or skip the wrap altogether and serve it over rice. On another note, I recently discovered an article on how to keep avocados from turning brown which is a handy tip for this recipe.